I had breakfast at my hotel early as agreed upon. When I came downstairs the kind owner said “you should have eggs, they will give you energy for cycling” so a delicious omelet with feta appeared before me. (Have I mentioned how delicious Albanian feta is?!) I savored my breakfast in the large dining hall I had all to myself. After checking out I was again on the same road I had unceremoniously tumbled on the day before. Feeling determined I turned up my music and quickly set a steady pace despite the heat. No nonsense today. This highway was mine. I rocked out to Hip Hop and ate up miles hungrily the beginning of the day. I reached the city of Fier and stopped to check my map. When I pushed off with my right leg to begin pedaling I felt a jarring sensation. My chain had not only fallen off my chainring, it had jammed up between my chainring and my derailleur. I stopped and began fidgeting with it one handed. An observer watched me for a moment before coming over and motioning for me to bring the bike further off the road. I did so and he bent down to get a closer look. Without another word he picked up a piece of paper from the ground (ok, one case where litter came in handy) and pulled the chain free with a few jiggles of my peddle. This guy knew his way around a malfunctioning chain. I thanked him with a litany of faleminderits and wished I had fruit or something as a token of my gratitude. He just stood back with his arms crossed and a look of pride. We contrived a short conversation consisting of him asking “sola?” (alone?) out of curiosity, me responding “po” (yes), and listing the names of the Albanian cities I was going to. I had so much appreciation for this man in this moment. Midway through my day I stopped at a kafe for something cold to drink. The owner sold me an iced tea then talked me into a byrek with a wave of his hand at the display case. This one was filled with vegetables. It was delish. 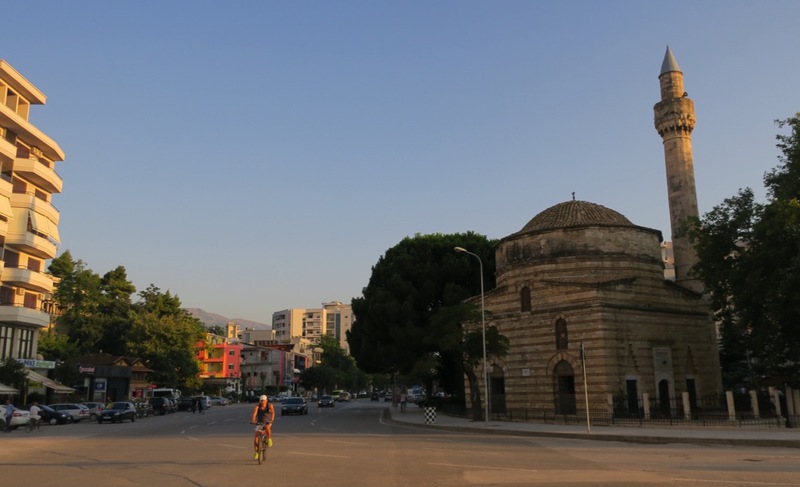 Next I cycled onto a small, quiet highway that would lead me to my destination of Vlorë, Albania. 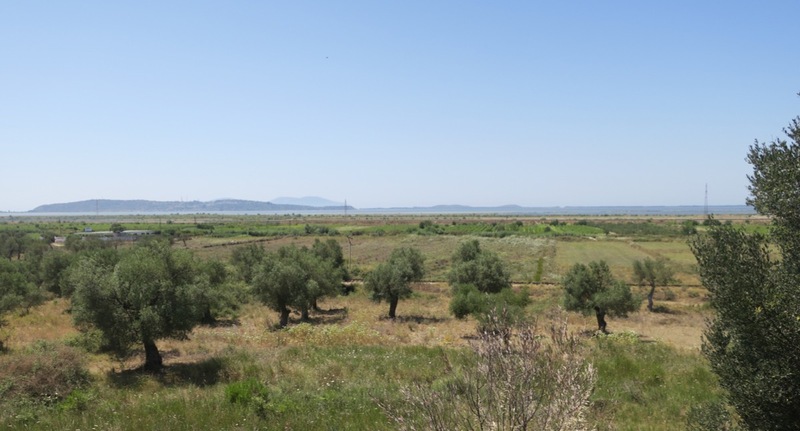 The windy road raised high enough from the surrounding flat land that I could see the Vlorë salt flats to my West. 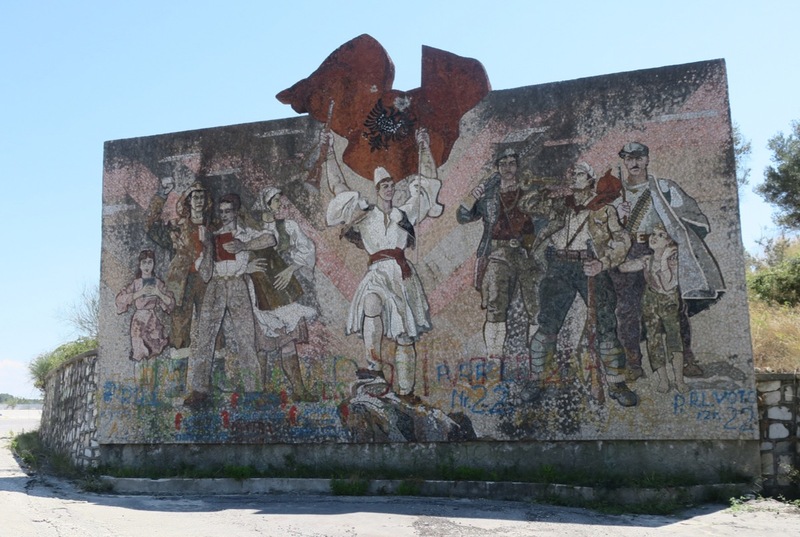 As I neared the city I came upon a large mosaic depicting Albania’s 1912 independence from the Ottoman Empire. I turned down a residential street and found my hostel with ease. Bright magenta letters on a greet wrought iron gate read “Vlora Backpackers”. 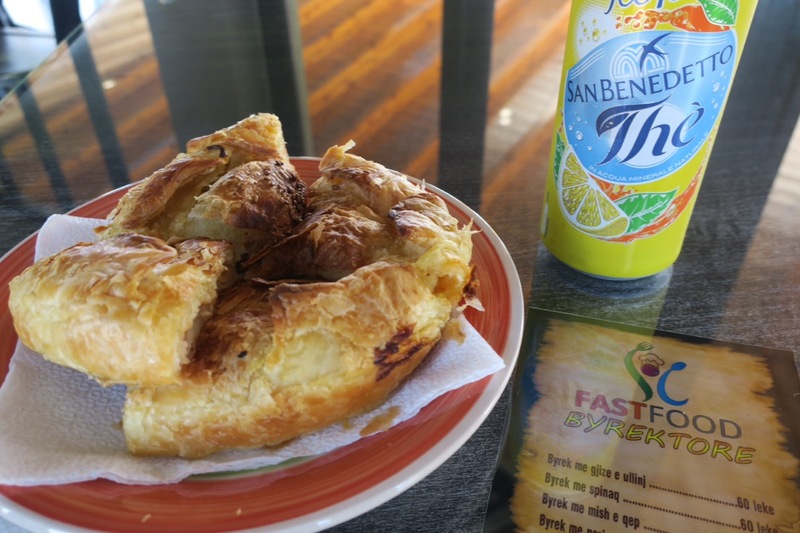 I stepped inside and met my kind host Festim who checked me in, and handed me a cold Tirana beer in welcoming. He also offered suggestions for what to do, see and eat in his city. His carefully hand drawn map in hand I headed out to explore the streets of Vlorë. I migrated toward the central city boulevard leading to the ocean. The sun was low in the sky as I meandered past a few independence statues and the city’s beloved Muradie Mosque. After a quick meal I continued my wandering towards the promenade. From the Mosque to the sea the streets were alive. Men, women, children, grandmothers and fathers; everyone was out in their finest. Kafes and restaurants were alive with conversation. Children darted through the crowd while the elderly proudly sauntered. Everyone was a part of the magic as evening merged into night.